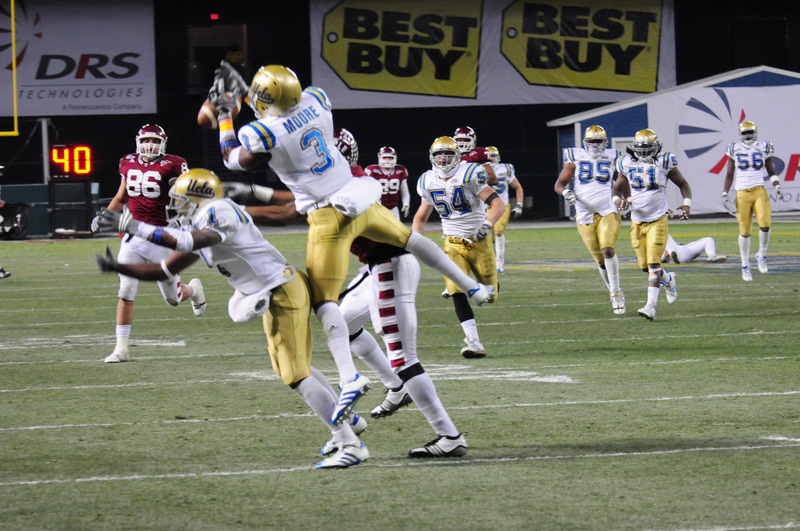 WASHINGTON (Dec. 30, 2009) -- The UCLA Bruins beat the Temple Owls, 30-21, in the EagleBank Bowl, Dec. 29, at RFK Stadium in Washington, D.C. But the real winners of the event were wounded Soldiers, Marines, Sailors and Airmen who benefit by involvement with the bowl game's charity partner "The Wounded Warrior Project." "We are privileged to be the charity partner this year," said Steve Gerrish, with the Wounded Warrior Project. "The mission of the Wounded Warrior Project is to honor and empower warriors and we have got a vast array of programs and services to help warriors and their families during their recovery and rehabilitation and transition." 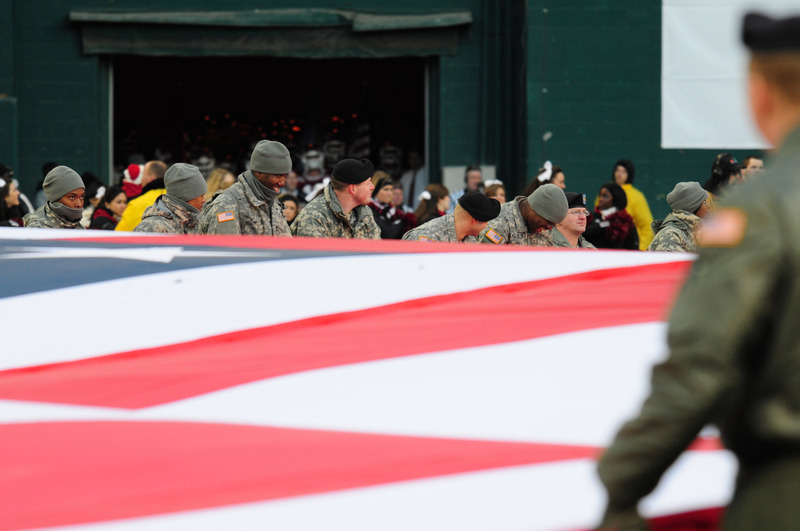 Soldiers, Marines, Sailors and Airmen unfurled an American flag during the opening of the Dec. 29 EagleBank Bowl game between the UCLA Bruins and the Temple Owls. UCLA beat Temple, 30-21. The real winners of the event were wounded Soldiers, Marines, Sailors and Airmen who benefit by involvement with the bowl game's charity partner "The Wounded Warrior Project." By being named as a charity partner of the bowl game, the Wounded Warrior Project received two television commercials for their program during the national telecast of the game, a large banner in the end zone at the stadium, and multiple announcements over the loud speakers at the game -- all designed to further awareness of the project. Steve Beck, executive director of EagleBank Bowl, explained why he felt the Wounded Warrior Project was a great choice for partnering with the EagleBank Bowl. "My colleagues and I had the opportunity to visit Walter Reed hospital a couple of weeks ago and see what the wounded warriors are going through, and how they get them back on their feet and make them active members of society," Beck said. "It is truly amazing and it is a very emotional and passionate thing to be involved with them." WWP representatives will also participate in special events in Washington, D.C., throughout the year as they did during game, beginning with the coin toss. UCLA sophomore Rahim Moore jumps for a pass during the Dec. 29 EagleBank Bowl game between the UCLA Bruins and the Temple Owls. UCLA beat Temple, 30-21. The real winners of the event were wounded Soldiers, Marines, Sailors and Airmen who benefit by involvement with the bowl game's charity partner "The Wounded Warrior Project." Ryan Lamke was one of the wounded warriors that participated in the coin toss at the start of the game. Lamke was a corporal in the Marine Corps and served as an infantry assault man in Iraq. While in Fallujah, Iraq in 2005, he sustained traumatic brain injury, orthopedic injuries to his left arm and post traumatic stress disorder. Lamke was medically retired from the Marine Corps, and says that his involvement with the Wounded Warrior Project helped him move on after his injuries. "I had no idea what kind of employment I was going to have," Lamke said of his post-military life. "And then one day I received an e-mail from a man named Ryan Kules -- who at the time was running our warriors-to-work program -- informing me about possible job opportunities here in the D.C. area." Lamke, a D.C.-area native, said the Wounded Warrior Project helped him find a job -- with the WWP itself. He now works with wounded warriors at both Bethesda Naval Hospital and at Walter Reed Army Medical Center. Sgt. 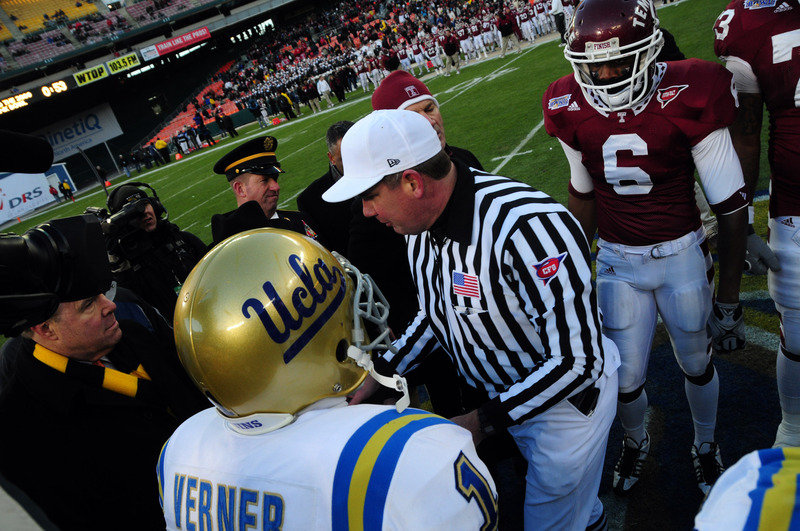 Maj. of the Army Kenneth O. Preston attended the coin toss before the Dec. 29 EagleBank Bowl game between the UCLA Bruins and the Temple Owls. UCLA beat Temple, 30-21. The real winners of the event were wounded Soldiers, Marines, Sailors and Airmen who benefit by involvement with the bowl game's charity partner "The Wounded Warrior Project." Participating in the coin toss at the game was something he never thought he'd do. "Growing up in the D.C. area, obviously, RFK stadium holds a special place in my heart," he said. "Growing up as a little kid in the stands watching the Redskins play -- and having a chance today to go out on the field and stand down there where some of the greatest Redskins once stood is a great honor." Sgt. Maj. of the Army Kenneth O. Preston was on the field during the coin toss, and also visited with some of those that attended the game. He recently returned from a visit to Iraq, Afghanistan and Kuwait and said it's refreshing to come home and see the kind of support for Soldiers that is evidenced by the relationship between EagleBank Bowl and the Wounded Warrior Project. "To see this kind of support for our wounded warriors back home, it just really shows that America stands behind them, and what they are doing out there as volunteers," Preston said. "For all of our wounded warriors, it really brings the recognition they deserve for their service and for the sacrifice they and their families have made. And it is very humbling to see Americans -- like Eagle Bank -- come out to support wounded warriors."